February is almost over. I have been stuck in an airport for 2 days and now have to try to get mentally back on track. I have lost my focus, at least for today. I am now trying to push four days into two. I know it wont work but I also know I will try. Flowers always make me happy, its a good way to refocus my energy back on painting. I am working on a large 36x18 painting that needs to be completed by the first of March. Wow have brush will paint. Hollyhocks with bees floral oil painting. 8x6 on canvas mounted on hardboard ready to frame. Oil painting on canvas mounted on hard board ready to frame. When I was small I ate a whole jar of these I loved them so much. I might have been okay if I hadn't also drank the juice. I couldn't look an olive in the little red pimento for years after that I had gotten so sick, but I have out grown it an olive are back on the yummy list. Jar of olives with a few on the side. Oil on stretched canvas ready to frame. Finally a little sun shine here in Florida making this daily painter smile all day long. I fly to Michigan tonight so I hope there is not too much snow in Detroit I may have forgotten how to drive in it.So today I enjoy the Sun shine and paint things tropical. ClearWater Beach. It was a cool day in Florida but still very tropical. oil on gallery wrapped stretched canvas with painted sides. The back is wired and this painting can be hung as is or framed if you like. 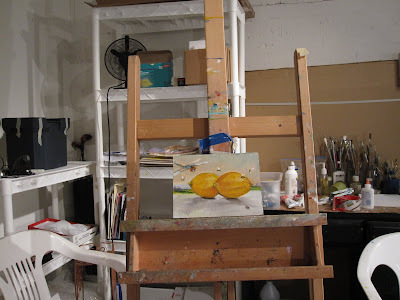 The process of painting an oil painting varies by the type ans size if the painting. Some artist paint each painting the same way. I use different techniques based on what I want to achieve. I start here with a painting panel made by RayMar Art. 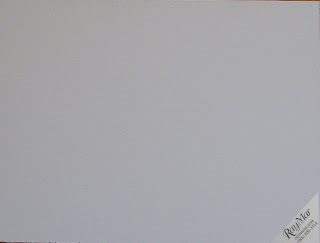 The front of the panel which has ultra smooth canvas mounted on it which permits more paint manipulation. I then do a quick thumb nail sketch. I don't put in many details because it will be painted over. Next I put in some bold lines and start the painting. In this painting I put in the background first because it was going to stay simple with little detail. 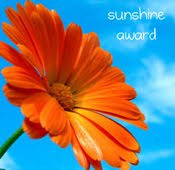 The Sunshine Award is an award given to blogs that have positive and creative blogging. 1. Post the Logo in a blog or on the sidebar. 2. Pass the award on to 12 bloggers that you follow. 3. Link the nominees with in your post. 4. Let the nominees know they have received the award by leaving a comment on their blog. 5. Share the love and link to the person who gave you the award. Now I get to pass this Sunshine on to 12 Creative Bloggers and bring sunshine into their day. I have selected the following blogs. I hope you enjoy them as much as I do. Enjoy their blogs if you haven't already found them! This painting is larger than my daily paintings normally are. This painting has rich color and texture with a quiet feeling. 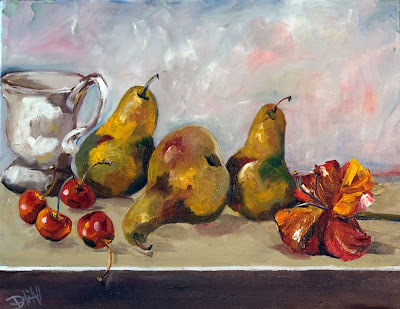 I wanted to emphasize the quite beauty I see in forms like pears and cherries. I relish the opportunity to do a variety of different things, it keeps me interested. This painting was part of the second monthly daily painting challenge . To view the painting challenge click on this link.I used watercolors and 140 lb cold pressed watercolor paper.The Painting is of some dried grasses on a snowy day in Pennsylvania. Here is the painting on my easel. I am painting in my studio in Florida right now. It is a little cramped but it's nice to be out of the snow even if it has rained almost every day and is in the 50's right now. Zoro the Party Pig is back at it stealing a little love.10x8 oil on canvas mounted on hardboard ready to frame. Just a quick still life before I eat them. About This Painting: Its always nice to have a plant in the house on cold days that brings a touch of spring to our hearts. oil on canvas mounted on hard board ready to frame. oil on canvas mounted on hardboard ready to frame. About This Painting: All about life, from coffee to cupcakes and cell phones.